We feature the Tom Harrell Quintet for the first set of tunes, with tracks from his new CD, Prana Dance. That is followed by a couple of tracks from fellow band members Wayne Escoffery and Danny Grissett CD's. I put out a call over the Facebook and Twitter for requests and got plenty of responses. Did my best to fulfill those. Check the sidebar of this website, and you'll find links to my social networking sites. Sign up and keep in touch. If you haven't already, subscribe to this podcast via iTunes and have the latest episode downloaded to your computer every week. 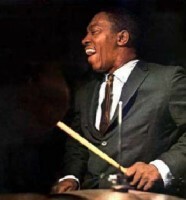 Art Blakey's Jazz Messengers was one of the most influential bands in the evolution of jazz. He is often credited with pioneering the hard-bop movement, taking the be-bop form and placing greater emphasis on the rhythm, giving the music a hard driving swing. We saw a Blakey tribute band in concert last night in Hartford that was the impetus for this playlist. We follow that set with a World-Jazz set in honor of International Jazz Day, May 23. This podcast pays tribute to the great alto sax player Jackie McLean on what would have been his 78th birthday on May 17. A protege of Charlie Parker and Miles Davis, McLean had a wide ranging influence on the jazz idiom. To those of us in the Hartford Connecticut area, where Jackie made his home in his later years, his influence is even deeper. He is responsible for mentoring many young jazz artists in the area and has created this great jazz scene in our city. In addition to being the Jazz director at University of Hartford's Hartt school of music, he was the founder of the Artists Collective which fosters the Arts in many forms in the urban areas of Hartford.